"Learn the rules like a pro, so you can break them like an artist. - Pablo Picasso"
“Weirdo” and “nerd” are atypical professional descriptors, unless you’re in marketing. Undoubtedly, marketers must be a bit different to succeed. Aside from requisite knowledge of the industry and their firm’s target client personas, it’s a big part of how these individuals help their companies grow and thrive. Add in a great sense of humor and the ability to talk to anyone about anything at the drop of a dime and you have the recipe for marketing gold. 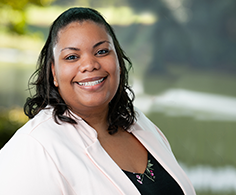 For DELTA |v|, that came in the form of Karina Tabron who joined the company as Marketing Coordinator in September 2018. In her role, she partners with the Vice President of Marketing and Business Development to help drive the growth and expansion of DELTA |v| and its subsidiaries. Karina’s unique background encompasses both professional services marketing and graphic design. She earned both her BS in Graphic Design and MS in Entertainment Business from Full Sail University. When asked to describe her favorite aspects of marketing, the words creativity, innovation, storytelling, and connections came to Karina’s mind. Each plays a role in how she thinks and acts, as well as how she forms meaningful connections with her colleagues and clients. Karina is excited to make a difference through her work at DELTA |v|. Outside of the office, you may find Karina freelance designing, cooking, reading/writing, catching up on shows/movies, and kickboxing. On weekends, she enjoys traveling, spending time with family and friends, going to festivals/concerts/shows, hiking, filming, volunteering, and visiting breweries/wineries.